You can apply for a library card online or at any public library. If you apply online, you will receive a temporary barcode number that can be used to request catalog items (if you create a PIN) or check out digital items from our OverDrive service. You must visit a library with the documents described below within two weeks to make your card permanent. If you do not, your temporary card will cease to function. Positive identification (ex. license, other photo ID), proof of current street address, (not a post office box #), and date of birth will be required to register for a new card. Register at any public library in either county or complete an online registration here. Please note that an online registration is temporary, pending a visit to the library with the above documentation. The signature of a parent or legal guardian is required for children 15 and under. The parent must possess or obtain a valid library card in the UHLS system that is in good standing in order for the child to get a library card. Patrons residing outside of Albany and Rensselaer counties will be charged $30 for six months or $50 per year per person for use of the library. An out-of-county card does not guarantee full privileges at Upper Hudson Library System libraries aside from the East Greenbush Community Library. A library card is required to borrow and renew materials. Library cards are non-transferable. The person issued the card must be the person using the card, unless you have filled out a permission slip for a friend or family member to pick up items for you. If a patron forgets his/her card, a driver’s license may be used up to three times. After the third time, the patron will be required to purchase a new card for $1.00. Most items checked out of a UHLS Library may be returned to any UHLS library. Exceptions: Museum passes and Stories-to-Go kits must be returned to our library. There is no limit on the amount of materials which may be borrowed except for video games (2) and museum passes (1). Cards are delinquent when your materials are overdue or $5.00 or more in damages or fines have accumulated on your card. Please report lost or stolen cards. Cards are delinquent when $5.00 or more in accumulated damages or fines have accumulated on your card. Delinquent borrowers forfeit their borrowing and computer privileges until items are returned and fines are paid. A drive-thru book drop is available 24-hours a day. Materials placed in the drop when the library is closed will be cleared the next business day. Juveniles 15 & under may borrow videos if an authorization form is on file at the circulation desk. Patrons can be notified by email or phone when their requests are in. An additional text message option is available. Login to your library account online to sign up for email notification. Charges for overdue items are added to your account. Unless you pay upon their return, you will be asked to settle the account before transacting any other business, including the use of a computer. Fines are charged for each day the library is open and the item is not returned. To avoid fines, return material before the library closes on the due date. All checks returned for insufficient funds will be charged a $25.00 administration fee. Vacation loans available on most not “new” items for a double loan period. *A $15 maximum fine applies if you return all overdue materials and pay the fine on the same business day. Telephone (477-7476): You must supply your library card number to library staff when calling with a telephone renewal. Materials can be renewed by phone if they are overdue and the fine does not exceed $5.00 on your account. Material may not be renewed if it has been reserved by another borrower or if it has exceeded the renewal limit (3). Material from other libraries may be renewed at EGCL but are subject to the owning library’s renewal policy. You will be notified once the requested item is available, and will have 7 days to pickup the item before it goes back into circulation. Once the request is on hold, if you would like to pick it up at the drive-thru window, you must call at least 30 minutes ahead to have the item ready at the window. The East Greenbush Community Library has designated the small meeting room previously called “the Literacy Room” as an Education and Employment Resource Center (EERC.) With the exception of Library planned activities, programs that deal with Education and Employment shall be given priority in scheduling. All groups using the space must comply with the Library’s meeting room policy with the exceptions noted below. In reserving the room, preference will be given to adult education, employment and Literacy Volunteers. These groups may reserve a room up to six (6) months in advance and are not limited to 12 times per year. Groups must comply with the established occupancy limit. If there are no programs scheduled, patrons may apply to reserve space in the room on the day of use only. No advanced registration for same day use is allowed. Quiet study will take precedence. The room must be vacated 15 minutes prior to the next scheduled use. Patrons requesting to use the room must register at the Adult Reference Desk with ID. A patron reserving the room must be at least 16 years old. This patron is responsible for the condition and conduct in the room. A patron may reserve a room for a two (2) hour time block per day. Groups are treated as one unit. A patron who has used a room as a member of a group may not reserve the room the same day. At least one member of the group or the patron who reserves the room must stay in the room throughout the session. An empty room may be assigned to other patrons. Patrons may not use the Library’s address or phone number as their contact point or expect library staff to assist with set-up, clean-up or receptionist duties. Additional furniture cannot be moved into the room. No alterations may be made to the room and nothing may be attached to the walls. The door must remain unobstructed and windows uncovered. Patrons using the EERC must return to the adult reference desk to check out. Patrons must return the room to a neat and orderly condition. Exceptions to this policy can be made at the discretion of the Director. East Greenbush Community Library maintains several display cases and an exhibit area available for public use. Exhibits must be approved by the library and are chosen for their cultural, informational, educational and entertainment value for people of all ages in the community. In reviewing exhibits, the library endeavors to present a broad spectrum of opinion and a variety of viewpoints. The views in the works exhibited are those of the artist and are not necessarily those of the East Greenbush Community Library. Exhibit areas may not be used by commercial, for-profit entities. Displays are for one month. They must be set up on the first of the month and must be removed the last day of the month. If the library must dismantle an exhibit because it is not removed as scheduled, the library is not responsible for damages or storing the exhibited items. Groups or artists may display once during a twelve-month period. Setting up and removing an exhibit will be the responsibility of the exhibitor. The library will assist with picture rail displays. Please make arrangements with the Program Coordinator. No prices may be affixed to exhibit works. A price list may be left with the program coordinator for the exhibit and the name and phone number of an exhibit’s contact person may be displayed so library patrons may contact him/her for further information about the exhibit. No sales may be made on the premises. No exhibit material, which is sold during its display in the library, may be removed before the end of the exhibition period. Exhibitors may not schedule special openings or other events without the permission of the library and such an event must be scheduled and approved by the East Greenbush Community Library Program Coordinator. Publicity for an exhibition is the responsibility of the exhibitor, however the library does post the information with examples of artwork on their website. The exhibitor must furnish his/her own labels. Labels may not be taped or nailed to back, sides or glass of a display case. The exhibitor’s name must be posted in the exhibit. Library sponsored displays have priority. The library reserves the right to preempt an exhibit for a library exhibit. The library will make every effort to give advance notice of such preemption and assist the exhibitor in reserving another date or exhibit case. The library does not assume responsibility for loss or damage of any item exhibited. All exhibited items are done so at the exhibitor’s risk. The exhibit cases/space must be left in satisfactory condition. Exhibitors using exhibit cases or space assume liability for any damage resulting from said usage. The library reserves the right to bar future exhibits for infringement of any of the above rules. Those who object to the content of an exhibit or part of an exhibit held at the library must submit their complaint on a Reconsideration of Library Exhibit form that will be judged according to the policies established by the library. All library users are encouraged to read the library’s Exhibit Policy before submitting their request. The Board of Trustees will review the Reconsideration request and notify the complainant in writing of the decision. Adopted by Board of Trustees January 16, 2001. Amended: October 21, 2003. All meetings must be free and open to the public. In instances specifically approved by the Library Director a non-profit group may charge a fee to offset the cost of materials for participants. Reservations must be made in advance. Completion of a Meeting Room Reservation Application is required to confirm any booking request. All reservations must be pre-approved by the library. Groups are limited to 12 meetings in a 12-month period. No consecutive days are allowed. Programs that are planned by the library take precedence. The library reserves the right to cancel a reservation for library purposes and will make every effort to find alternative meeting space within the library should a conflict occur. The library has the right to cancel any scheduled use in an emergency. After the Library requirements, preference will be given to library related organizations, and Community groups. Reservations are on a first come first serve basis. These groups may reserve a room up to six (6) months in advance. Public services and organizations wishing to provide programs that are of public or community interest may reserve the room no more than three (3) months in advance. Reservations are on a first-come-first-serve basis. The Library reserves the right to determine what is or is not of public or community interest., this decision is at the discretion of the Library Director. Meeting rooms may not be used for private/board meetings, and/or trainings, commercial or for-profit purposes. They may not be used for advertising or fundraising purposes. Information presented by commercial groups must be of an educational nature and may not refer to services provided by that particular institution. All literature to be distributed is subject to library approval. Meetings rooms are available for use only during the library’s hours of operation. Set-up may not begin before the library’s normal opening time. Please adjust commencement of morning meetings accordingly. All members of the group must vacate the meeting room 15 minutes prior to the library’s normal closing time. Library hours are: Monday-Thursday, 9am-9pm; Friday, 9am-6pm; Saturday, 10am-5pm and Sundays 1-5pm. The library is closed on Sundays in July & August. Due to the high demand of our library meeting rooms, a minimum advance notice of 24 hours is required for any cancellation. Failure to inform the library of a cancellation may result in loss of reservation privileges. All groups serving food or beverages, or using the rooms for arts and crafts activities, are required to make a $25 deposit which will be returned if no extra custodial services are required to prepare the room for future activities. Groups who do not retrieve their deposit within six months following their program, forfeit their deposit. Food and beverages must remain in the meeting room. Any damage to library facilities, willful or negligent, will be charged to the sponsoring group. The library is not responsible for loss or damage to the property of either the sponsoring group or persons in attendance. The library will not store any organization’s property or supplies. When scheduled for use by minors, an adult supervisor must be present at all times who is personally responsible for the conduct of the event. Absent parental authorization, minors are not permitted to attend programs in public meeting rooms. Audiovisual equipment is available for meeting room use. The library cannot provide operators for the audiovisual equipment. Groups are responsible for loss or damage to library equipment. Publicity for a meeting is the responsibility of the organizer. The library may not be named as a contact point for information about, or registration for the event. The library does not take responsibility for handling inquiries regarding scheduled meetings. Neither the name nor address of the library may be used as the official address or headquarters of an organization. The library reserves the right to order the room cleared and/or bar future meeting room use for infringement of any of the above rules. Use of a meeting room does not necessarily mean endorsement by the East Greenbush Community Library. Tables, chairs and AV equipment cannot be provided for use in the patio. Groups must bring their own. (See #11). Adopted by Board of Trustees January 16, 2001. Amended October 21, 2003. Amended 2-09. Amended 5-11. Amended 1-15. The East Greenbush Community Library seeks to provide quality library service to all patrons. The following code has been adopted for the convenience of all patrons and for the protection of the rights of all those using and working in the library. All laws of the State of New York and the United States are enforced at the library. Staff members are authorized to enforce this code of conduct. All conversation should be kept as low as possible. All equipment with sound (i.e. mp3 players, laptops, smartphones, etc.) must be used only with earphones in the large open spaces of the library, and should not disturb other patrons. Cell phones should be set on vibrate when entering the building and conversations should be pursued in the entrance hallway, especially not in the computer lab, or other areas where study and/or computer use is occurring. Parents are responsible for the actions of their children. Parents will be notified if a child’s actions are disruptive. Children under the age of 8 must be accompanied by an adult. Children from 8-11 should have a parent in the building. See the Unattended Children Policy. Only animals intended to serve people with disabilities are allowed in the building. The East Greenbush Community Library building and grounds is a smoke free environment. NO smoking is permitted. Any behavior that compromises the safety or security of the Library staff or patrons is prohibited. Use of verbal or physical threats in the library or through the use of library technology to insult or intimidate library patrons or staff is strictly prohibited. Any form of intimidation or harassment, whether direct or implied, physical or verbal, directed at the gender or sexual orientation of a patron or a staff member will not be tolerated. Persons exhibiting such behavior will be requested to leave the premises. Offensive Remarks: Comments, innuendos, or insinuations of a sexual nature, however intended, when directed to a patron or staff member are inappropriate and should be avoided at all times. No food and drink allowed in the public areas of the library. Meeting Rooms are sometimes used for events which include food with the approval of the Director. Patrons shall respect all library materials and facilities, including computer database and computer equipment. Stealing, damaging or altering library property is prohibited and will be subject to financial liability for damages. Customary clothing in the library should include shirts and shoes. Footwear that damages or compromises library floors may not be worn in the library-(i.e., in-line skates and cleats). Furniture must be used for intended purposes. One person per seat please. Patrons should dispose of litter they create. The Library grounds are open for use when the Library opens in the morning to dusk. It is the responsibility of the users of the library grounds to keep the grounds free of litter and damage. Any damage done to Library property will be the financial responsibility of the person who created the damage. All automobiles must be parked in designated areas. Cars must travel with extreme caution, as pedestrians may come out of anywhere. All traffic signs must be respected, for the safety of all library users. Use of skateboards, in-line skates and bicycles in the parking lot and on library property creates a safety issue for library users and pedestrians and is prohibited. Use of bicycles for transport to the library is acceptable, but bicycles must be locked at the outdoor bicycle rack. Patrons must clean up after their pets outdoors. Patrons must report injuries or concerns to Library personnel inside. Library personnel have the authority to have patrons removed from the library building and/or grounds for improper conduct or misuse of the area. In order to provide a safe and open environment where community students may receive tutoring, the Library permits the use of designated portions of the main room for regularly organized and scheduled tutoring services. This privilege, however, places the obligation on the tutor to abide by the procedures and restrictions set forth below. Beginning September 1, 2013, tutors wishing to utilize the Library must register with the reference desk. Registration is valid from September 1 to August 31. 1. Tutors are individuals who provide instruction to others either on a paid or volunteer basis. Tutors shall work with a maximum of one (1) student per tutor per session. The Library is not to be used as classroom or office space, but as a safe and quiet workspace for students to receive instruction to be successful. 2. The Library does not sponsor, recommend, or assume liability or responsibility for the work and/or activities of tutors who use available library space. All arrangements must be made between the tutor, student and parent/guardian. Money should not be changing hands in the Library. Payments should be arranged prior to the tutoring sessions taking place. 3. Tutoring is only allowed in designated areas. (Indicated on the map) All other areas are designated as Quiet Study Areas. Space in the Library will be available for use by tutors on a first-come, first served basis. Reservations cannot be made nor can the expectation be made that others will be asked to move to accommodate a tutoring session. 4. Space designated for tutoring in the Children’s Room is reserved for students in the 6th grade and younger. 5. Tutors and their students are required to follow the Library’s Code of Conduct. The Library reserves the right to ask tutoring or study groups that become too loud or disruptive to leave the Library. 6. Students must be under the tutor’s supervision at all times during the scheduled tutorial. The tutor is responsible for the student’s behavior at such time. Pick up of student is the responsibility of the parent/guardian in consultation with the tutor. 7. It is the responsibility of tutors to establish communication with their students, and not to instruct the students or their parent/guardian to contact the Library regarding their work. The Library staff cannot take or deliver messages to students or their tutors. The Library’s phones are not for use by tutors or students. 8. Conversations and instruction between tutor and student should not disrupt, distract or otherwise interfere with other patrons’ use of the Library. 9. Tutors and students must provide their own supplies. A policy is necessary to address the issue of families using the library as a childcare center and leaving children unattended in the library. The policy is also necessary to provide for the general safety of children in the library and to make parents aware that the library is a public building, open to all manner of people, and can therefore present risk to children. Children under 11 must be accompanied at the library by a parent/guardian/authorized caregiver age 13 or over except while in attendance at a library program. Children under 8 must be accompanied in the Children’s Reading Room by a parent/ guardian/authorized caregiver age 13 or over at all times. A parent may be asked to stay with their child, regardless of age, if the child’s behavior warrants it. If a child remains at the library after closing time the librarian in charge will make sure the child has called for a ride. The staff member will remain with the minor for 15 minutes at which time, if the child has not been picked up, staff will notify the police. The librarian will remain with the child until the police arrive. Children of any age are not welcome in the library if they are ill or disruptive. Minors are the responsibility of their parent, guardian, or authorized caregiver age 13 or over, not of the library. The library takes no responsibility for the safety or welfare of children left unattended at the library. If a child under 11 is not accompanied by a parent or guardian at the library the librarian will call the parent or guardian to pick up the child. If a parent or guardian cannot be reached, and/or cannot pick up the child, police will be called and apprised of the situation. In the event of abuse of library privileges by a child, the library shall contact the parent/guardian. Should the library need to contact a parent/guardian of any child and they are not on site or cannot be reached the librarian will notify the police. Access to the Internet on Library computers is available for use by patrons. Usage is provided in set increments, which may be limited based on demand. There is no time limit for wireless users. To reserve and use a Library computer, patrons must have a UHLS library card in good standing, or a guest pass. Guest passes are only available to patrons who do not already have a UHLS library card. Wireless network users may access the Library’s public network during library hours. Library staff may assist users in connecting to the network, but the Library does not guarantee that all devices will work with the network. Just as libraries do not vouch for or endorse the viewpoints of written material in their collections, they do not do so for electronic information. Parents and guardians are responsible for monitoring their child’s use of the Internet. Any restriction of a child’s access is the responsibility of the parent/guardian, not the library staff. Dissemination of information through the Internet is a joint responsibility of the child and the parent/guardian. Users are required to log in each time to use the Internet computers. A maximum of two users at the workstation at a time is allowed. If the computer is shared, all users must agree to the library’s Internet policy. Files may be saved to the the library computer’s hard drive temporarily, but will be erased at the end of the usage session. To save files beyond then, patrons may provide their own USB storage media or purchase one from the library. Users requiring sound must use headphones. Users are responsible for all printing fees. Hardware and software on library computers may not be altered. Wireless connections less secure than wired connections. Users are advised use caution and take additional security measures when transmitting sensitive information using any of the Library’s public networks. Library computers may not be used to attempt to gain unauthorized access to any data, computer or network. The library does not permit violation of any U.S. or state law or regulation including, but not restricted to, acts of a threatening, harassing or obscene nature. Patrons must respect copyright laws and licensing agreements. Any criminal or otherwise illegal conduct is prohibited, including the public display of offensive sexual materials as restricted by NYS or Federal Penal Laws, when using a public PC. The library reserves the right to limit access to pertinent web resources to maintain compliance with this legislation. Misuse of the Internet computer by not complying with these procedures and policies will result in loss of privileges. While the library offers access and guidance to a wide array of useful and interesting Internet sites, some may contain inaccurate, controversial, and even offensive material. The library does not monitor and has no control over the information accessed through the Internet and cannot be responsible for its content. Use of the wireless network is entirely at the risk of the user. The library disclaims any and all liability for lost or stolen hardware, loss of confidential information, or damages resulting from the use of the wireless network. Adopted by the Board of Trustees 11/18/97, amended 8/17/99, 10/15/02, 10/21/03, 5/19/09, 3/18/2014, 10/16/2018. The East Greenbush Community Library maintains laptop computers available for checkout by patrons of the Upper Hudson Library System with an account in good standing. The laptops run on the Windows 10 Professional operating system, and are equipped with Microsoft Office 2010 and internet connectivity. The library assumes no responsibility for damage to peripherals or loss of work due to equipment failure. Laptops can be checked out at the Reference Desk by patrons 16 and older. Age exceptions can be made at the discretion of the Director. Laptops are available on a first-come, first-served basis and cannot be reserved. One laptop may be checked out per patron, with no renewals. A current, valid library card or picture ID is required at checkout. Laptops must be used in the library; they may not be taken out of the building. Removing a laptop from the building will be considered theft, and the police will be notified. Laptop borrowers must also agree to the Internet and Wireless Network policies. Laptop loan period is 2½ hours. Laptop is not to be left unattended at any time. Patron documents can be saved temporarily to the laptop’s desktop, but will be deleted on restart or upon equipment failure. Patrons must use a flash drive or email to reliably retain documents. Patrons are not allowed to install software or change system settings on the laptop. The laptop must be returned to the librarian at the reference desk in the same operating condition as when it was borrowed. The patron must remain at the reference desk until check-in is completed. The laptop must be checked in at least one hour prior to closing time, even if that means an abbreviated session for the patron. Library staff will check the laptop for any damage. If damage has occurred, charges will be assessed accordingly. The library reserves the right to assess a fine if returned late. If the laptop is not returned before closing, it will be considered stolen and the police will be notified. The laptop replacement cost will be assessed and charged against the patron’s library card. Damage and part loss charges will be assessed at replacement value and charged against the patron’s library card. If a laptop is stolen while checked out to a patron, the Library assumes no responsibility. Replacement cost will be assessed and charged against the patron’s library card. Troubleshooting: If you experience problems with the laptop’s hardware or software, please bring the laptop to the Reference Desk for assistance. New York State Law (Civil Practice Laws and Rules sec 2307 §4509) guarantees the confidentiality of library patron borrowing records. Patron information will only be released to the card holder or to a third party in compliance with law. As a public institution the Library is legally obligated to comply with the Patriot Act. Items that have been returned are automatically erased from a patron’s record, unless they have opted to save their checkout history. Under New York State Law, if you are signing for a library card for someone under age 16, the library is, under the above law, prohibited from revealing that minor’s borrowed materials to you. The Library may use patron information for library mailings and emails. The library has a Friends group, and allows this group to also use the patron data. Patrons who do not wish this information shared with the Friends may notify the library and be removed from that list. The Library does not sell, lease, or otherwise distribute or disclose patron name, email address, postal address, telephone number, or other personal information to outside parties. When patrons visit the library website, the Library collects and stores only information needed to measure the number of visitors to different areas of the site and to assist in making the site more useful. Website and computer usage data is separate from individual library account data. Search histories are not saved in the Patron’s Library record. The Library also offers a wireless network that allows patrons to connect to the Internet. Data accessed and sent over the wireless network is not encrypted. Some databases the library offers on the website require the barcode number from the user’s library card for verification purposes. Database vendors will not have access to patron records. Second party websites like Amazon and those accessed through our subject pages are not governed by this policy and may collect other information. See the relevant site’s policy for more information. If a patron initiates a reference inquiry through form or email, or subscribes to the Library’s newsletter on the website, this information is considered as part of the borrower account and protected as outlined above. The majority of Bulletin Boards in the East Greenbush Community Library are reserved for Library and Friends of the Library Programs and notices. 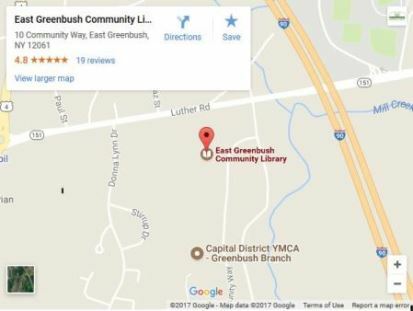 In its role as a center for community information, East Greenbush Community Library supports the free flow of information and exchange of ideas. It therefore provides designated Community Bulletin Board(s) and Community Literature Rack(s) where individuals and groups in the community can announce events and services that are of general and current interest. The Library may permit leaflets, newsletters, posters, flyers or other material to be posted on the Community Bulletin Board(s) and displayed in the Community Literature Rack(s) for distribution at the Library. Due to limited display space, the Library is under no obligation to post or distribute said material. Community notices may only be posted on designated Community Bulletin Board(s) and/or Literature Rack(s). Notices may not be mounted to walls, doors, windows, or other surfaces. If damages occur, the posting parties are responsible for the cost of repairs. The Library assumes no responsibility for the preservation, protection or possible damage to or theft of any notices displayed. The Library reserves the right to reject material because of size as well as content and to determine the length of time material may be displayed. Community Bulletin Board(s) and Community Literature Rack(s) are available on a first come, first serve basis, within limitations of space and according to the following guidelines. Notices not complying with these guidelines will be removed. The Bulletin Board(s) and Literature Rack(s) will be maintained by a Staff Member appointed by the Director. Only one copy of a notice can be displayed on a Bulletin Board. Maximum size is 8.5×11 inches. Materials must clearly show date of posting. Maximum posting of each notice will be 30 days. Notices of events should be removed after the event has taken place. Notices should be placed so other notices are not obscured. If both posters and brochures are supplied, the Library reserves the right to choose which will be the more useful format for public display. Posting or distribution of such notices does not imply Library endorsement of ideas, issues, or events promoted by those materials. Notices advocating fraud, defamatory, slanderous, unlawful actions or that the Library considers to be inappropriate are not permitted. Partisan political posters, fliers and handouts shall not be displayed on Library bulletin boards or Library property. The Library reserves the right to make exceptions to this policy on a case-by-case basis, subject to approval by the Director. The East Greenbush Community Library acknowledges the importance of gifts and donations to the Library’s operations and to its future development. The Library welcomes gifts and donations of money, property and materials. Gifts of library materials (books, magazines, tapes, audio-visual items, etc.) may be accepted with the understanding that the Library reserves the right to add such materials to its collection, distribute them to other libraries, give such materials to the Friends of the East Greenbush Community Library, sell or discard. Any gifts with attached conditions whether donations of monies, books, periodicals, audio-visual materials or artwork must have the conditions submitted in writing and approved by the Board of Trustees. Such gifts will be accepted on the condition if the specific use requested is consistent with the goals and objectives of the Library. Individual unrestricted monetary gifts over $100 will be used at the discretion of the Library Board of Trustees in accordance with this gift policy and/or the Library’s material selection policy. Individual unrestricted gifts under $100 can be used at the discretion of the Director. Responsibility for the appraisal or the estimation of the value of gift donations lies with the donor. Neither the Library nor the Board of Trustees will assess or suggest a value for non-monetary gifts for income tax or other purposes; any letter of acknowledgement will not contain a statement of value. The decision as to the acceptance and location of gifts of landscaping items, gifts of ornamentation, sculpture and signage shall be made by the Board of Trustees, in consultation with the Library Director. In the official or employment capacity as Library Trustee or staff, no person shall accept personal gifts of any kind from a member of the public or vendors, except for (a) small items of nominal value, or (b) gifts that are traditionally given in recognition of a milestone event (i.e., retirement). All other personal gifts, including tips, must be: (a) refused; (b) returned to the sender with an explanation that acceptance of gifts is contrary to Library policy; or (c) remitted to the Library Director as a gift to the Library. The library exists to provide education, information, materials, reference sources and reading, listening, and viewing pleasure to all the people within its chartered area. Because of space and budget limitations, it is necessary to establish a Materials Selection Policy. Selection of books and other library material is the responsibility of the library director, and, under her/his direction, qualified members of the professional staff. The board is ultimately responsible for the selection of all material so selected. Selection of library holdings is based on interest, information, and the enlightenment of all library patrons. No book or library material shall be excluded because of the race, nationality, political, or social views of the author. The board defends the principles of the freedom to read, listen to, or view and declares that whenever censorship is involved no book or other library materials shall be removed from the library’s holdings except under the orders of a court of competent jurisdiction. It is the responsibility of the library director and the library staff to adhere to the principles and concepts stated in Materials Selection Policy. BOARD means the East Greenbush Community Library Board of Trustees. LIBRARY means the East Greenbush Community Library. The words HOLDINGS and MATERIALS are synonymous and refer to the East Greenbush Community Library’s collection of books, magazines, records, cassettes, compact discs, video and audiotapes, maps, pamphlets, toys, and any other pertinent materials. Publishers, librarians, and booksellers do not need to endorse every idea or presentation contained in the books they make available. It would conflict with the public interest for them to establish their own political, moral, or aesthetic views as a standard for determining what books should be published or circulated. It is our professional responsibility to resist the constraint of labeling or prejudging a film on the basis of the moral, religious or political beliefs of the producer or filmmaker or on the basis of controversial content. It is our professional responsibility to contest vigorously, by all lawful means, every encroachment upon the public’s freedom to view. Programming is an important part of the East Greenbush Community Library’s mission and Plan of Service. Programs are defined as any group activity offered to the public that library staff have coordinated, planned, and/or presented, whether offered in or out of the library. Programs include, but are not limited to: book discussions, story times, demonstrations, musical and theatrical performances, lectures, films, instructional classes, tours, and information literacy instruction. Groups that use the meeting room for their own purposes are not covered by this policy, and must adhere to the Meeting Room Policy. Library programs are free and open to the public. With the approval of the Director an optional charge for materials or books that participants will keep may be levied. Selection of topics, presenters, and performers for programming is made exclusively by professional library staff on the basis of interest and needs of the library users and the community. Professional qualifications and references of presenters and performers will be fully vetted by professional library staff. Final review and approval of topic, content and presenter will be the responsibility of the Director. Unsolicited offers from individuals or organizations to present programs will be subjected to the same standards used by library staff when planning library-originated programming. The number and frequency of library programs vary. When it furthers the library’s mission to do so, the library may participate in cooperative programs with other agencies, organizations, institutions, or individuals. Programs sponsored by the library shall be designed to appeal to a broad range of ages, tastes, and interests. Some programs for youth, geared to their specific interests and developmental needs, may be restricted by age level. All programs targeted toward specific audiences will be publicized as such. Library sponsorship of a program does not constitute an endorsement of the content of the program or the views expressed by presenters or participants. The library does not conduct programming that is purely commercial or religious in nature. Every attempt will be made to include all who wish to attend a program. However, when safety or the success of the program requires it, attendance may be limited. When limits must be established, registration will be required and may be restricted by residency. Attendance at non-registered programs will be determined on a first come, first serve basis. Suggestions, questions or concerns about library sponsored programs should be referred to library administration.